MEYLE filters – for a clean bill of health. 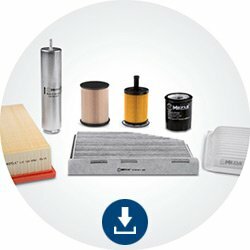 MEYLE filters do a fine cleaning job: High-performance filtration media and precisely crafted pleated elements with a large filtering surface guarantee excellent filtration efficiency. Exceptional technical features combine to create a class-leading component. Subjected to the multi-pass test our fluid filters prove their outstanding screening performance and dirt-hold capacity. Crafted with maximum accuracy of fit the filters testify to MEYLE quality. Select MEYLE fuel filters are manufactured and quality-tested in Germany. They are built to deliver exceptional filtering performance throughout their entire service life. MEYLE filters provide efficient protection to the engine and the environment – and benefits any passengers prone to allergies. Your first line of defence: MEYLE cabin air filters. MEYLE particle filters reliably remove pollen, fine dust and other potentially hazardous airborne particulates. An additional activated carbon layer prevents harmful and malodorous gases from entering the vehicle cabin. Find practical installation instructions in PDF file format for all makes and models from Citroën to Volkswagen. about filters as download files.